Reputation management is the process of giving another entity complete control over their online search engine results. Consumer reviews are considered to be the number one decision factors that many consumers use while reviewing a company or service. You need a seasoned professional that has experience in removing bad press releases, reviews, blog posts, social media attacks and any other negativity pertaining to your company or business. Search engine results on yourself and your company can have a huge impact on your business. It is a known fact that well over 90% of individuals don’t look past the first page search results for whatever they are searching for. 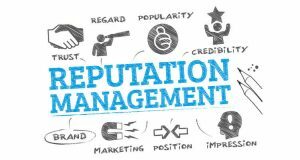 Reputation management involves creating high quality diverse web properties to overtake the first page of all search engines with positive and unique written content. I use proprietary software developed in house with tested methods to guarantee the inevitable. A clean name for yourself. Contact me today to discuss your situation so I can go into detail over what I can do for you and your business. I realize how important it is to keep a clean slate with your name and I take every possible precaution to ensure that your good name is repaired as quickly as possible.